Here is a sample of the Shirts we have Native Embroidery designs on. 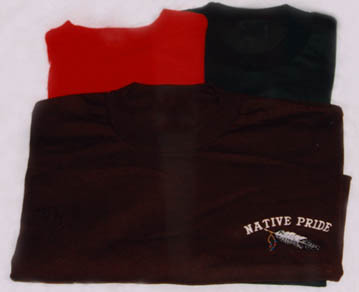 All Native Pride clothing is produced with top quality material to ensure the highest quality available to you the customer. Short sleeve, No collar, 50/50 blend (poly/cotton), Henley shirt, available in the following colors: beige, blue, black, charcoal, gray, white. These shirts are embroidered with the following designs: Buffalo Skull, Bear, Bear Claw, Concho, Dream Catcher, Eagle Feather, Last Buffalo, Medicine Wheel, NP-Native Pride, Staff, Sun, White Buffalo, and Zuni Sun. 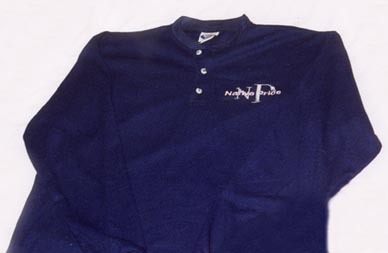 Long sleeve, No collar, 50/50 blend (poly/cotton) Henley shirt, available in the following colors: beige, blue, black, charcoal, gray, white. 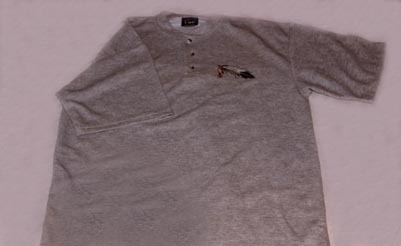 These shirts are embroidered with the following designs: (This item is seasonal) Buffalo Skull, Bear, Bear Claw, Concho, Dream Catcher, Eagle Feather, Last Buffalo, Medicine Wheel, NP-Native Pride, Staff, Sun, White Buffalo, and Zuni Sun. 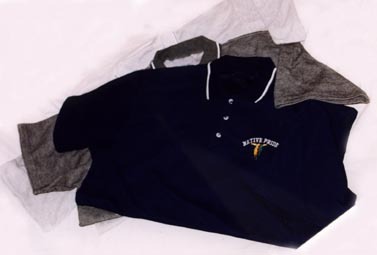 Short sleeve, collar, 50/50 (poly/cotton), Polo shirt, available in the following colors: beige, blue, black, charcoal, dark brown, gray, white. These shirts are embroidered with the following designs: Buffalo Skull, Bear, Bear Claw, Concho, Dream Catcher, Eagle Feather, Last Buffalo, Medicine Wheel, NP-Native Pride, Staff, Sun, White Buffalo, and Zuni Sun. Short sleeve, 100% cotton, T-shirt, available in the following colors: beige, blue, black, brown, charcoal, dark blue, dark brown, dark green, gray, green, lime, maroon, orange, red, royal blue, violet, white, yellow. These shirts are available in the following designs: Buffalo Skull, Bear, Bear Claw, Concho, Dream Catcher, Eagle Feather, Last Buffalo, Medicine Wheel, NP-Native Pride, Pipes, Shield, Staff, Sun, White Buffalo, and Zuni Sun. available in 7X by special order. Email NativePride, and ask about the 7X sizes.